Used as an indoor plant, and also suited to outdoors in warmer climates, Calathea Makoyana is grown for the foliage. Commonly known as the ‘Peacock Plant’ for the glossy and colourful patterned foliage. 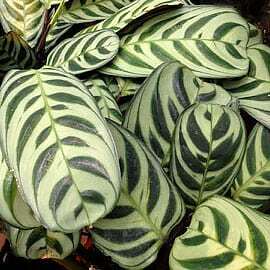 This is a low growing Calathea species, clump forming plant with large variegated foliage, contrasting two tone green. Another common name is Cathedral Windows, the foliage does look a little like stained glass from a distance. Although it originates from sub-tropical areas, it is as an indoor plant that it is most widely used. Foliage is best described as a pale green with prominent mid green markings, the reverse is a purple colour. The natural habitat is in sub tropical climates, however it is widely grown as an indoor or house plant and very popular in commercial buildings and shopping centres. The bold foliage adds colour and interest year round. Exposure to sun will determine the colour of the foliage, this is a plant that has more vibrant colour when grown in the shade. If you can create a little humidity and a good filtered light this is an easy care plant. We suggest placing a saucer of pebbles which is filled with water beneath the container when growing indoors. This will increase the humidity without the root system becoming water logged. A little mist spraying, especially in air conditioned and heated areas will also assist with raising humidity. The growing medium or soil, should not be allowed to dry out, this does mean wet and soggy soil, just moist. Fertiliser while the plant is in active growth is also recommended. For indoor plants, a general purpose slow release type is best. It is best to repot the plant every 2 – 3 years to replenish the growing medium. This is an excellent plant for containers and pots, also well suited to underplant taller species in sub tropical to tropical climates. Widely grown indoors. Also suited to growing in hanging baskets. Very popular as a year round feature plant when grown in containers and suited to a shaded position on a warm patio or balcony. Common Names – Peacock Plant, Cathedral Windows. Height – Will reach around 30 – 60 cm in height. Spread – Will form a clump over time to around 40cm before needing division. Climate – Warm with some humidity. Foliage – Variegated, pale and mid green, oval shaped to 15cm in length. Underside of the foliage is purple. Light – Filtered light, not suited to direct sun. Calathea Makoyana is available for sale from the following online suppliers.